When Dr. Heidi Horsley was in college, she lost her 17-year-old brother Scott in a car accident. “The loss was so severe for me and the pain was so great, I honestly didn’t know how I was going to survive or if I even wanted to.” She remembers the early years, and how many people told her she needed to be strong for her parents. Not only was that advice unhelpful, but it was also hurtful. 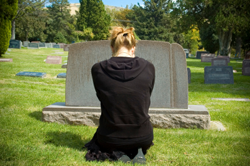 Today, as an industry expert on grief and loss, Dr. Horsley shares the best tips for coping and healing when you experience a loss. First, make sure you validate your feelings. No matter what you’re feeling, it’s valid and important. She points out that it’s extremely difficult to live without a sibling. Assuming you’re close in age, it’s assumed that you will have your sibling for life. No matter what your age when they die, it comes as a shock. “I thought that I would die before my brother,” she says, since it was only natural as he was younger. Having a new type of relationship, and continuing that bond after death, doesn’t come easily. It’s easy for sibling loss to be disenfranchised since much of the focus is on the parents. Dr. Horsley urges everyone to find support if you’ve lost a sibling. A support group and being surrounded by those who understand your pain is critical. She considers her brother her guiding light to this day, and says he’s the inspiration for everything she does. Fortunately, she’s now in the position to help others through a similar loss. The field of death, dying, and grieving has evolved in the past few years, but we still have a long way to go.